Terrorists from Hamas-controlled Gaza fire three rockets at southern Israel. No injuries or damages reported. 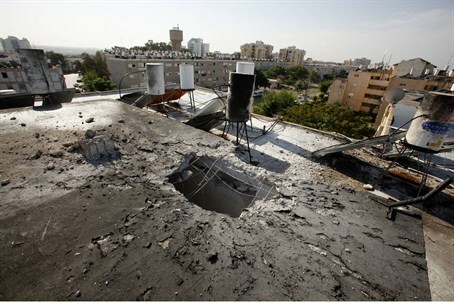 Terrorists from Hamas-controlled Gaza fired three rockets at southern Israel early Wednesday morning. At least one rocket exploded in an open region of the Hof Ashkelon Regional Council, causing no physical injuries or damages. Two other rockets may have exploded in Gaza. The rocket attacks come after a period of relative quiet in the region. The Israel Security Agency (Shin Bet) said recently that May 2013 saw a decline in the number of terror attacks carried out against Israelis by Palestinian Authority Arab terrorists. The report noted that in May there only three attacks which originated in Gaza, as opposed to 12 in April. Two of the three attacks were rocket attacks and the third one was a small arms shooting. In May, Israel restored the fishing zone off the coast of Gaza to six nautical miles, after reducing it to three in March due to rocket attacks. The restriction was imposed after terrorists fired two rockets at southern Israel on March 21, one of which caused damage to the yard of a house in the town of Sderot, during a three-day visit by President Barack Obama.